And since I’m still working on perfecting my raw chocolate hollow Easter eggs (eek! 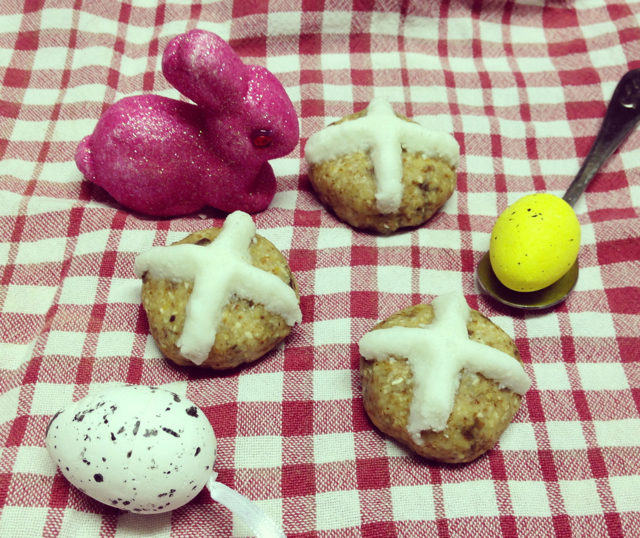 I hope I make it in time), I’ve decided to share my very tasty and super quick raw mini hot cross buns. I was really hoping to get into some festive baking this year. Unfortunately the change in weather has also brought with it some nasty viruses that have hit our family hard, turning my Easter baking dreams into a coughy, vomity, snot fest… ah well there’s alway next year! Since I haven’t really been up to baking my own hot cross buns, I thought I’d do the next best thing and make some raw bliss balls that look like hot cross buns. They have all the flavours of hot cross buns without the baking. I still feel like I’m making something festive for the kids, and they only take 15mins make! Combine almonds and oats in a food processor and process until fine. Add all other ingredients except the sultanas and process until well combined. Add sultanas and process until well combined while leaving small chunks of sultanas throughout the mixture. Roll tbs amount of mixture into balls and place on a tray lined with baking paper. Combine all ingredients in a bowl and mix until smooth. The mixture should have an icing like consistency. Add more almond milk if the coconut is dry. Fill a piping bag with coconut mixture and pipe onto buns in a cross shape. Refrigerate for 10min until set. Note: These hot cross buns can really firm up if refrigerated for more than 30min. Take them out of the fridge 20min before you plan to eat them.